Is there anything more useful to a new mum than a muslin cloth? Before I had children I was only dimly aware of them but, ever since Bud's first day in the world they've been an ever present in our home. Even now LM is two and a half there's always one around although they don't get used quite as often anymore. When Bud was born there seemed to be a choice of white, white or white but in recent years I've seen a range of coloured and patterned muslins become available which are a great way to brighten up your changing bag. 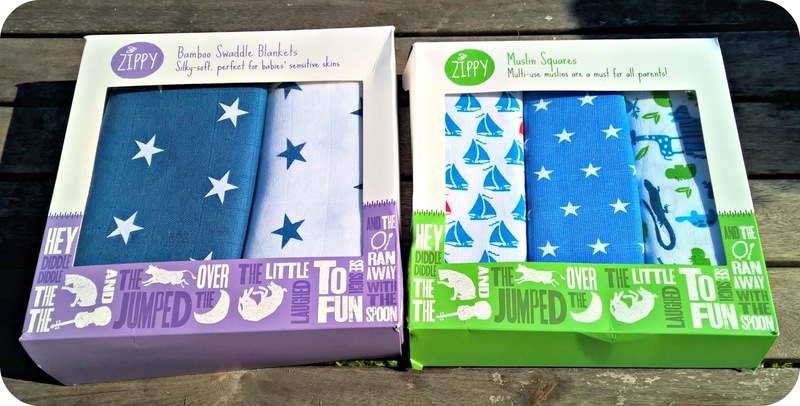 Recently I was offered the opportunity to review the new range of Zippy patterned muslin squares and swaddle blankets and I've been taking a look at them as part of my preparation for Red Rose Baby's arrival. 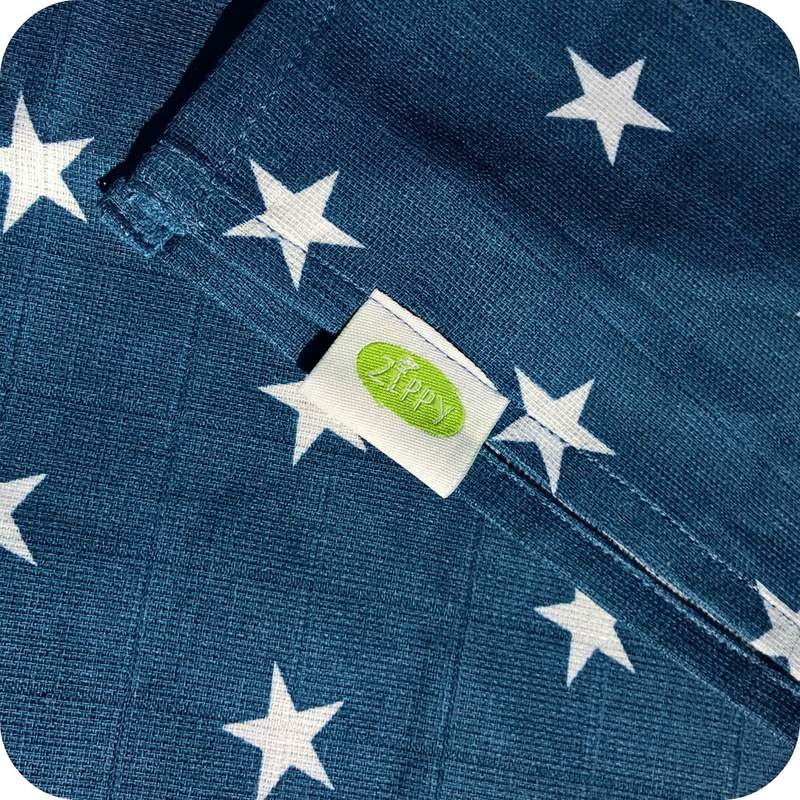 Zippy are a company that I became aware of about twelve months ago. They are most known for their innovative range of sleepsuits which fasten with a single zip instead of a series of poppers, available for babies up to 18 months old. In addition the Zippy range includes hats, bibs and bandanas and I love their bright and colourful pattern choices. New to the range is their muslin squares and swaddle blankets and I've been trying out a set of each. The muslin squares are available in sets of three, across four different colourways. Two in shades of blue and two in shades of pink. We were sent the Stylish Blue squares which include a bright blue square with white stars on it, a white one printed with blue and red sailing boats, and a white muslin printed with zoo animals in various shades of blue and green. The muslins are presented in a funky cardboard box which makes it a lovely gift for a new mum and her newborn. Obviously, Red Rose Baby hasn't arrived yet but I've washed the muslins, ready to pack into my hospital bag and I'm so pleased with the softness of them. They are a generously sized square and I know I'll be making a lot of use of them, whether as burp clothes. changing mat liners or impromptu bibs, amongst the myriad uses for a muslin! The second box in our parcel contained a set of two Bamboo Swaddle Blankets. I received the Navy and White Star set. 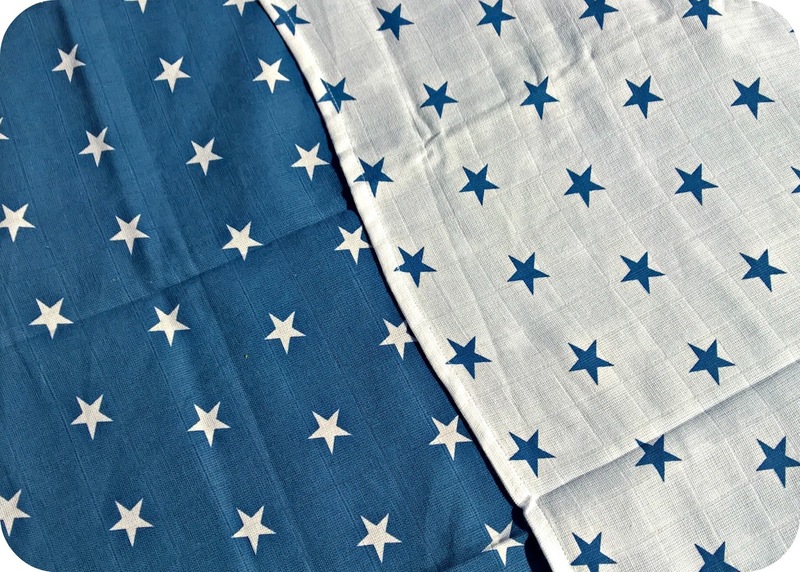 In a similar bright box to those containing the muslin squares you will find a blue blanket with white stars and a white blanket with blue stars. Although Zippy describe it as Navy it's more of a French Navy than a classic Navy blue. If you're looking for a more girly set then the alternative is a pretty pastel pink and white set. I couldn't love these any more if I tried! Red Rose Baby will spend their first few months in the Summer heat (hopefully) so thick, woolly blankets won't be needed, instead I'll be layering thin blankets to keep them warm but ensure that they don't overheat. These blankets will be completely perfect for this. I've never really swaddled my two, neither of them were overly keen on feeling restrained in any way but I'll try, yet again, with Red Rose Baby and I think that these blankets will be the perfect size for this. 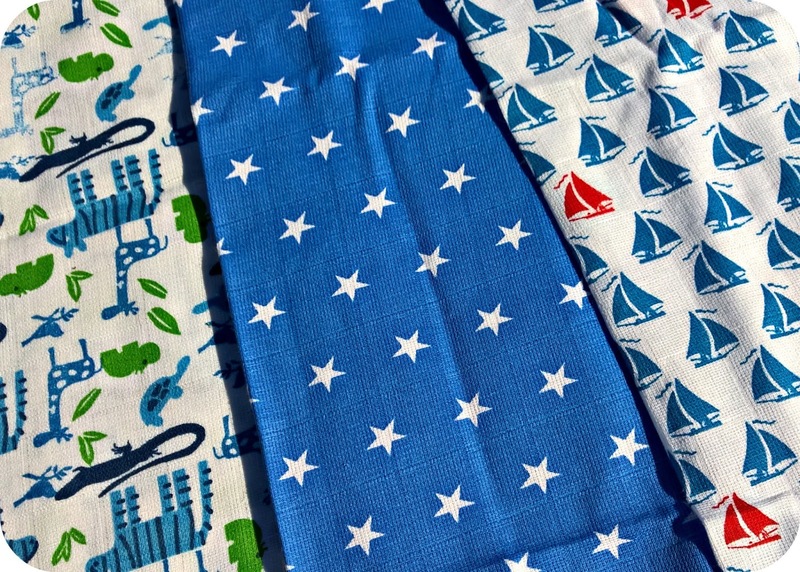 I can also see me using them in much the same way as a muslin square, the large rectangular size will be perfect for using as an impromptu sun shade, car seat or pushchair liner, or on a changing mat. The design is gorgeous, it taps into the current trend for stars and the blue is bright and eye catching too. Again these have been washed ready to use with our new arrival and just one wash has made them feel so soft and snuggly. I can't wait to use them with Red Rose Baby. Bamboo is renowned for being soft against a little one's skin and Zippy have also been careful to use a light, open weave for safe swaddling. Keep an eye on my Instagram feed to see lots of photos of the swaddle blankets and muslin squares in use following Red Rose Baby's arrival! The muslin squares are £14 for three, while the swaddle blankets are £20 for two. Either set would make a wonderful gift for any new parents . 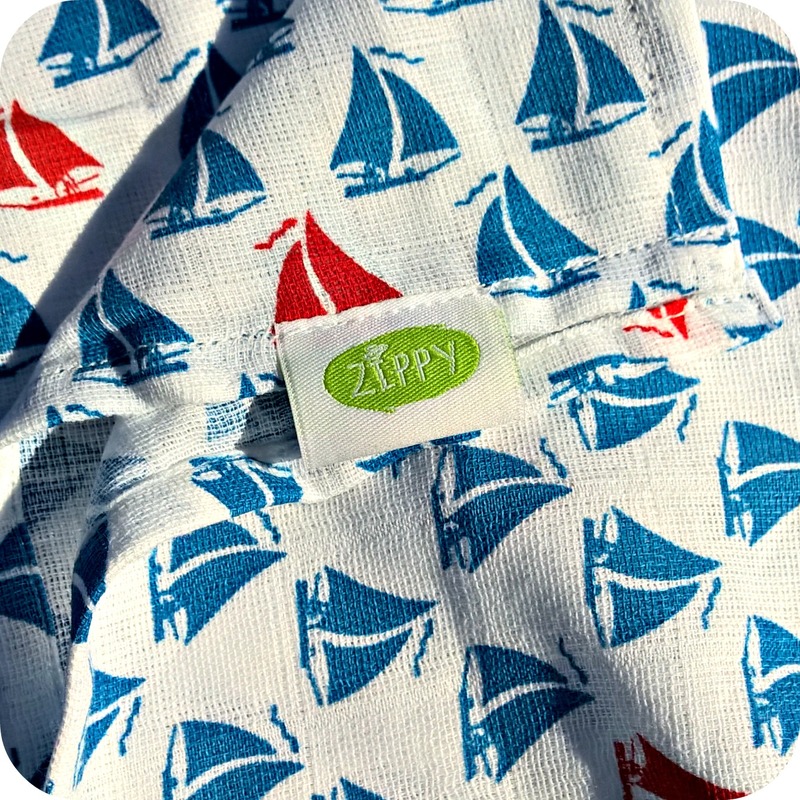 I've teamed up with Zippy to give away a set of their new swaddle blankets. To enter simply complete the Gleam widget below. The blog post comment is compulsory and will unlock a range of additional entries. Please read the terms and conditions. Disclosure: I received both sets for review purposes.